While hotels and bed and breakfasts offer great amenities, try thinking family fun and a place to stretch out and have a home environment and what you might come up with is cabin rental. My friend Rose Hammitt and I headed south right after Thanksgiving and hit a few trails, some shops and lots of eateries. I keep coming back to this area and the cabin stay at Willowbrook Cabins offered space, privacy and because I didn’t have any cell phone connection even a real feeling of being technology free although I do admit to going online! The cabins are the brain child of Doug and DeVore, a very busy young couple. With three kids 9, 7 and four the two central Illinois born and bred duo met on a blind date in high school then came to Carbondale for college at Southern Illinois University. Once they arrived in southern Illinois they never looked back they have been here ever since. Carrie, a geologist and Doug, a Systems Manager have found another niche for themselves in the beautiful Shawnee Forest. “God put me in a certain situation,” Doug shared explaining how a phone call from a friend landed him in a good position allowing them to stay in the southern Illinois area. “We bought seven acres,” Carrie said. Working for a while for an environmental company out of Springfield, the couple thought they would have more time for their children and pursue a dream in the land they have come to love by going into business. They opened a cabin rental business they call Willowbrook Cabins http://www.willowbrookcabins.com/shawnee_forest_photos.html. It was Carrie’s dad that first mentioned the cabin idea. The first thought was that this was not feasible, but with a bit of market research Carrie and Doug found out how busy cabin rentals are and that there is a great demand in part because of the vast outdoor wilderness offered by the Shawnee National Forest. “There are over two-hundred-ninety-five-thousand acres in the Shawnee National Forest and at least 100,000 of them are in Pope County,” Doug explained. Besides computers, Doug also has a marketing background that has proven very effective, so with market research in their back pocket the couple’s first endeavor was Big Creek Cabins http://www.bigcreekcabins.com/index.php. , a luxury cabin they built on their acreage. Located just minutes away from the Shawnee Hills Wine Trail and several of the most unique attractions of the Shawnee National Forest the cabin offers amenities such as a pool table, hot tub and most of all a beautiful view. This cabin was a labor of love. “It has real exposed beams and a black walnut bed made from a tree we took down,” Doug shared. 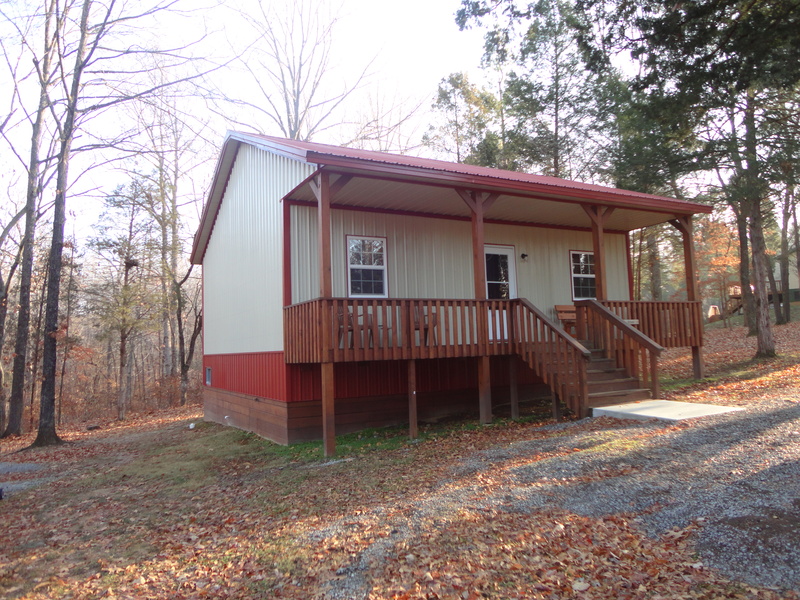 With the next year the chance to buy an established cabin business came up they had some decisions to make. “We thought about it long and hard. It is 45 minutes away in Eddyville but there is a main fiber line. There at the cabins they have better Internet conductivity than we have at home,” Doug laughed. Along with being located down the road from the largest public land area in three states the location and nice amenities made this a buy they could not resist. They have marketed, revamped and added on cabins with currently four cabins available. The cabins offer at least two private bedrooms (with one cabin offering three), a very clean nice bathroom, fully stocked kitchen, satellite TV and in most Internet access. The cabins offer either a deck or the forest right outside the front door. With Carrie’s woman’s touch, although often frequented by hunters, the décor and neatness of the cabins draw visitors from all walks of life and suited Rose and I just fine! We enjoyed the serenity of the quiet location after driving in the morning and hiking in the afternoon. During the hunting season the cabins have been filled every weekend. But hunters are not the only takes. “We have hosted groups with every bed filled,” Carrie added. They just had to turn away a group that was looking for accommodations for 100! The word is out. In fact the DeVores recently they had a famous visitor, Jordan Hembrough who hosts the Toy Hunter show that airs on the Travel Channel. Hembrough stayed in one of the Willowcreek cabins while traveling in search of rare vintage items to sell at the New York Comic Com. You don’t have to be a famous toy guy though to get a room, just contact Doug or Carrie and they can set you up! Next Post: A Touch of Home, an Amana Oasis! A great place to plan a winter escape!